MANDAUE CITY,CEBU – WBO world minimumweight champion Vic Saludar was a guest during the weigh-in and press conference for the “DOUBLE RUMBLE” fight card set to be held August 18 at the Mandaue City Sports and Cultural Complex. Together with fellow world title-holder Jhack Tepora (WBA interim featherweight) they wished the participating boxers good luck. Saludar was interviewed by this writer about his victory last month in Kobe, Japan when he dethroned Ryuya Yamanaka by unanimous decision. It was a close fight from the start, with two of the three judges scoring it even after round six. Saludar, of course, had no way of knowing the scores but he sensed it was close. The scores of the three judges were as follows – Daniel Sandoval (USA) – 115-113, Carlos Ortiz,Jr (USA)- 116-111 and Pinit Prayadsab (Thailand) – 117-110. Saludar lost in his first world title attempt in 2015, when then champion Kosei Tanaka stopped him with a body shot in round six. 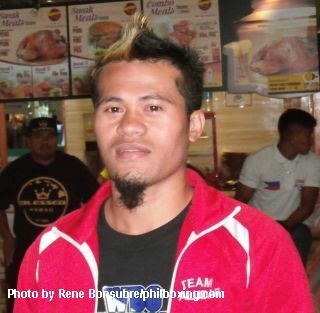 The 27 year old Saludar (18-3,10KO’s) hails from Polomolok, South Cotabato. He was a bronze medalist in the 2010 Asian Games but missed out on a chance to represent the country in the 2012 Olympics. “I injured my hand and had to undergo surgery,” He showed me the scar on the dorsal side of his left hand. “So it was (Mark Anthony) Barriga who went to the Olympics.” Saludar would turn pro in 2013. This writer asked Saludar if he would be interested to represent Philippines in the Olympics, considering that pros are now allowed to join the boxing competition of the Summer games. “I have different priorities now, I have a manager and a promoter now, I just can’t go back to the national team again.” He replied. His older brother, Froilan Saludar, lost to WBO flyweight champ Sho Kimura of Japan in Qingdao, China by sixth round knockout a couple of weeks after Vic’s victory. The August 18 fight card will feature two regional title bouts - Undefeated prospect Christian Araneta (15W-0L,13KO’s) of the Omega Gym is pitted against Jerry Tomogdan (25W-9L-4D,13KO’s) for the vacant WBC Asia Silver light flyweight title while Jaber Zayani (14-0,8KO’s) of France and Filipino Eduardo Mancito (16-8-2,9KO’s) will dispute the WBO Oriental junior lightweight title. Set to appear on the undercards are former ‘Buhay Boksingero’ champions Joebert Alverez and Gerpaul Valero, Kawelo Alcos of Hawaii vs Patrick Dakay, Ponciano Rimandiman vs Arian Lerasan, Marjun Piencenaves vs Jeffrey Stella and Carlo Bacaro vs Matthew Fondales.